i always have tons of different hair and makeup products on my wishlist that i could talk about forever, so i won’t write about those because that deserves it’s own post. i am going to tell you about some of the things that are/were on my wishlist that i love! 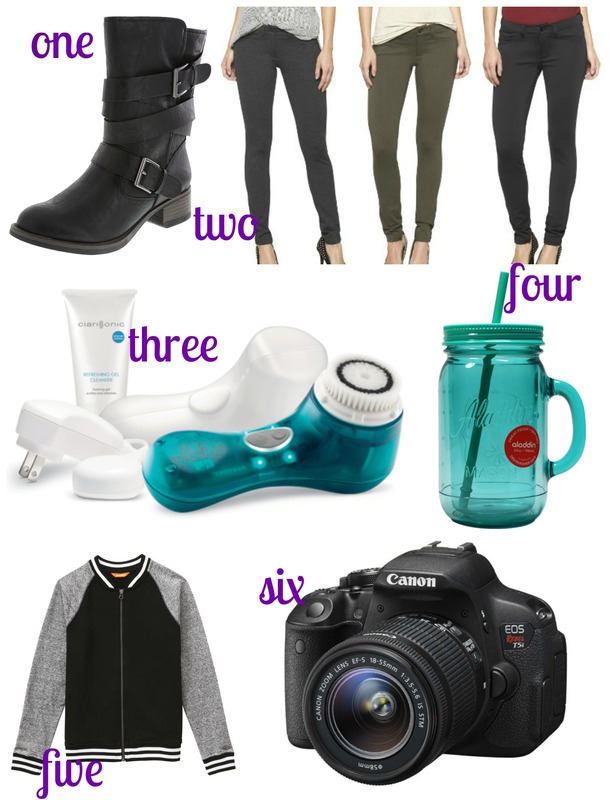 1) i am on the hunt for a nice, comfortable, versatile pair of black boots for work and basically…everything else. i’ve been looking at this pair and this pair at payless shoesource. i’m still looking around though. maybe i should look for a better brand so the quality will be better and last me longer…thoughts? any brands you love? 2) i have also been looking for some nice skinny ponte pants that fit a curvy woman, which is no easy task. but, i have found the perfect ones! they are super stretchy, mid-rise and sturdy. i am going to be buying a zillion more pairs so i never run out of them! i found them at target, get them here. 3) i really want a clarisonic. my skin has been getting worse and i really need to upgrade my face cleansing game. i need my skin to look good for the rest of my life! isn’t this one such a pretty color? i love it! and you know if it’s cute, then it works better. it’s science. 4) speaking of things that work better because it’s cute, i recently got this mason jar cup form walmart. it’s so cute!! and it makes me want to drink water all the time because i love having it around me! can you tell my favorite color is any shade of blue-green? haha, blue-green all the things! get the cup here. 5) before we moved i went through my entire closet and emptied it of things i haven’t worn for years. i also saw a few holes that i wanted to fill, one of those holes being a cute jacket that will go with everything but not be too plain,and not too bulky…well i found it! as soon as i saw this jacket, i loved it. i am going to wear this thing everyday (as soon as it gets colder). it is from joe fresh but i got it at jcpenney for a cheaper price! find it at jcp here. 6) the biggest item on my wish list is a D-SLR camera. i have been saving up so i can buy one for christmas! i have to do more research to help me pick which one i want though. i am thinking about a canon…maybe the canon rebel t5i? do you have a D-SLR camera? tell me what you love/hate about please! you should do it!! i will let you know which one i buy and how i like it! Oh I love that second pair of boots you posted. I’ve been looking for black boots for… about a year. Whoops! i have been too! actually probably longer…i’m super picky when it comes to fit and style and everything so it’s really hard for me to find things especially shoes! i really love those boots though too!